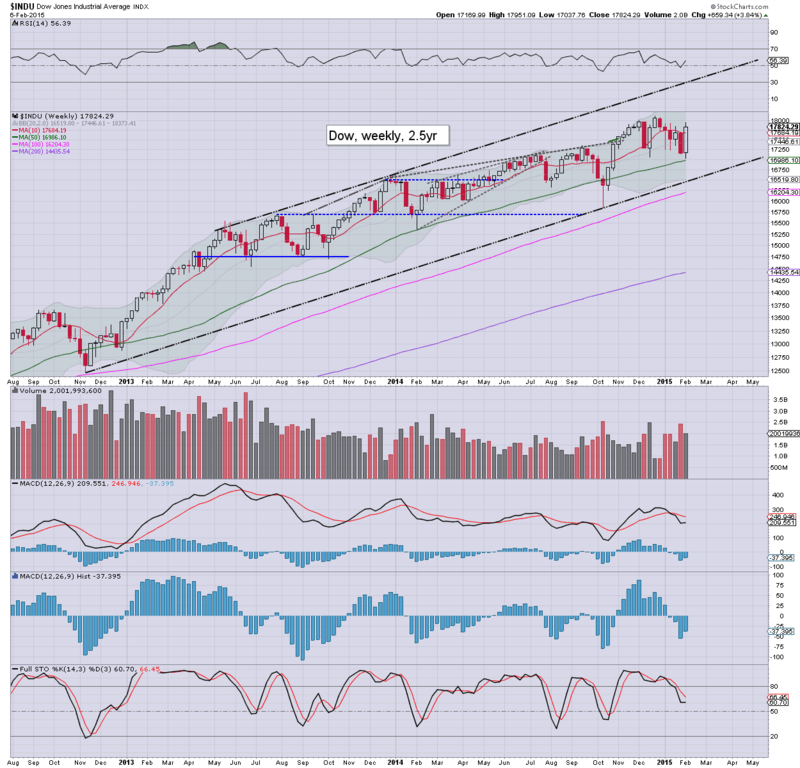 US equity indexes have started a new month on a particularly bullish note. 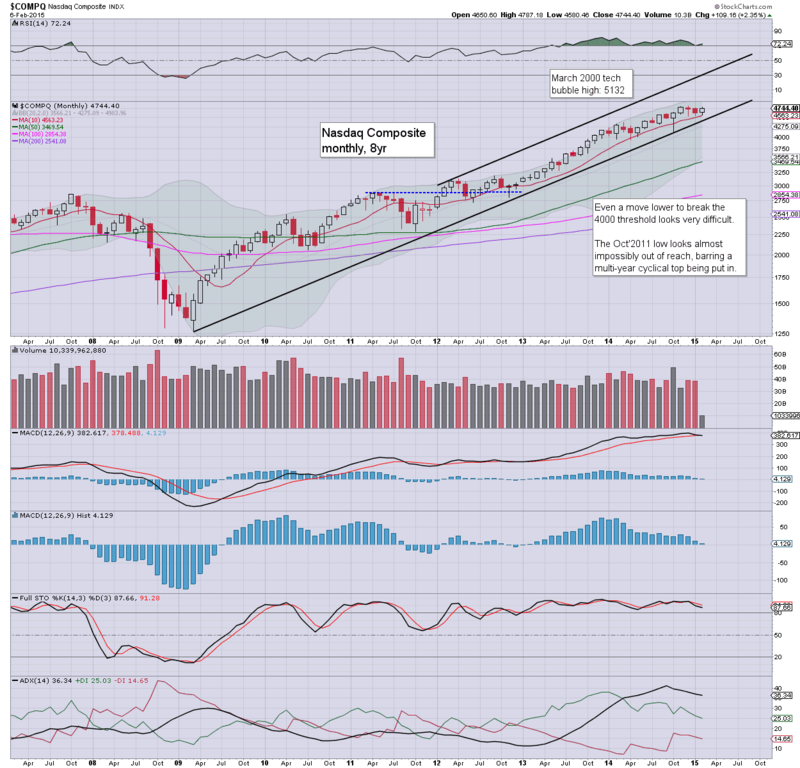 Net monthly gains currently range from 3.8% (Dow), 3.0% (sp'500), to 2.3% (Nasdaq Comp'). Near term outlook is bullish, although it is notable that underlying price pressure is now slightly in favour of the bears. We're just one week into February, and the sp'500 is already net higher by a rather significant 3%. 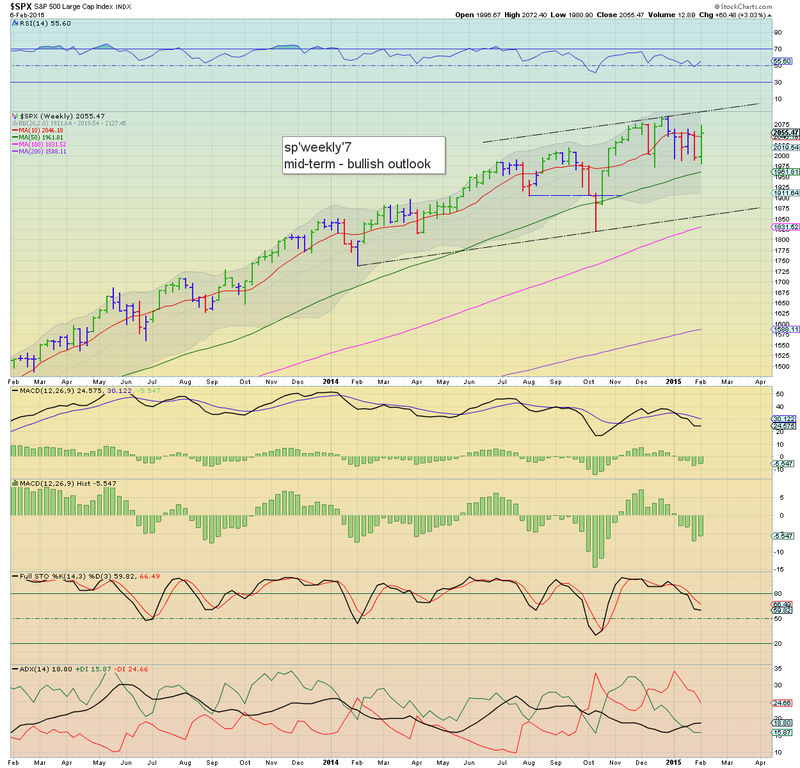 The Dec' high of 2093 is just over 2% away, and certainly looks viable this month. However, it is HIGHLY notable that despite a very strong week, the monthly bearish MACD (blue bar histogram) cross seen at the January close is holding. For those equity bears who are resolutely seeking major downside in the relatively near term.. it remains a somewhat important technical aspect. Meanwhile, equity bulls can sustain a down wave to 1950 without too much damage to the primary upward trend. On the flip side, upper monthly bollinger is offering the 2140/50s in the immediate term. The tech' climbed a significant 2.3% this week, and is very close to breaking the Dec' high of 4814. Indeed, the March' 2000 bubble high of 5132 remains within striking range this spring. 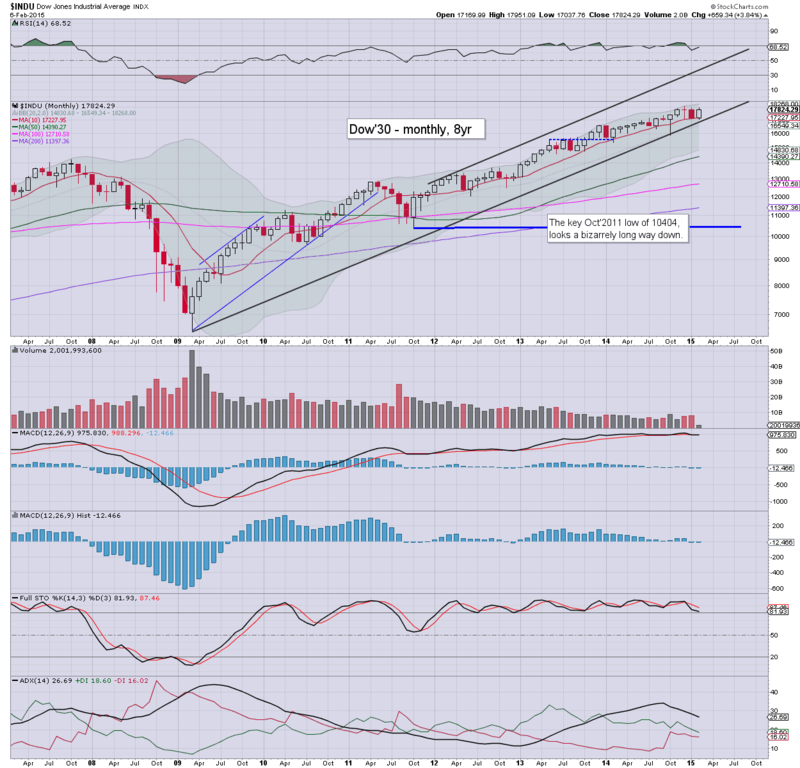 Any monthly close in the 5200s would confirm a straight up move to 7k or so by spring 2016. It is notable though that the underlying MACD cycle is very close to turning negative. The mighty Dow came close to breaking key support of 17k this Monday morning, but has since surged, with a net weekly gain of 3.8% to 17824. 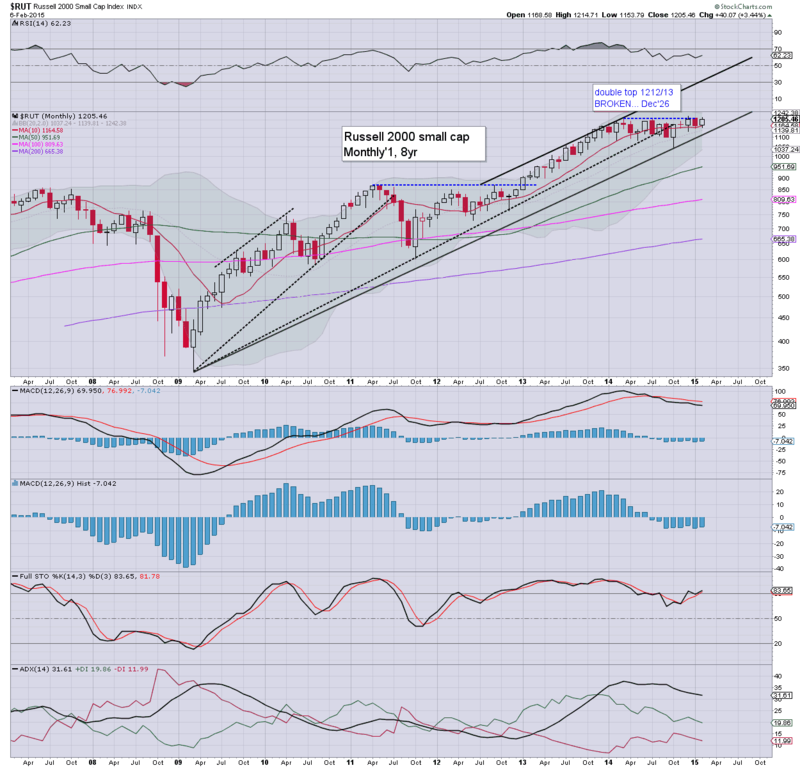 The Dec' high of 18103 is now within range, with the monthly upper bol' is offering the 18200/300s in the immediate term. Underlying MACD cycle remains negative for the second consecutive month. If 17k is lost... the door is open to 15k, but that seems unlikely after this weeks strong price action. The master index climbed 2.9% this past week, and remains stuck under 11k. A sustained break under 10500 would be bearish, and open up 9500 by April. Underlying MACD cycle remains negative... for the fifth consecutive month. The second market leader saw a strong week, climbing 3.4% to 1205. Considering the break to new historic highs in late December, both price action and structure favours the bulls. However, underlying MACD cycle remains negative for the eighth consecutive month, which now exceeds the down wave of 2011/12. First key support remains 1150.. if that fails to hold.. then the giant 1000 threshold is viable. The 'old leader' remains broadly bullish. Price structure is arguably a large multi-month bull flag, with prices generally holding above the 10MA. 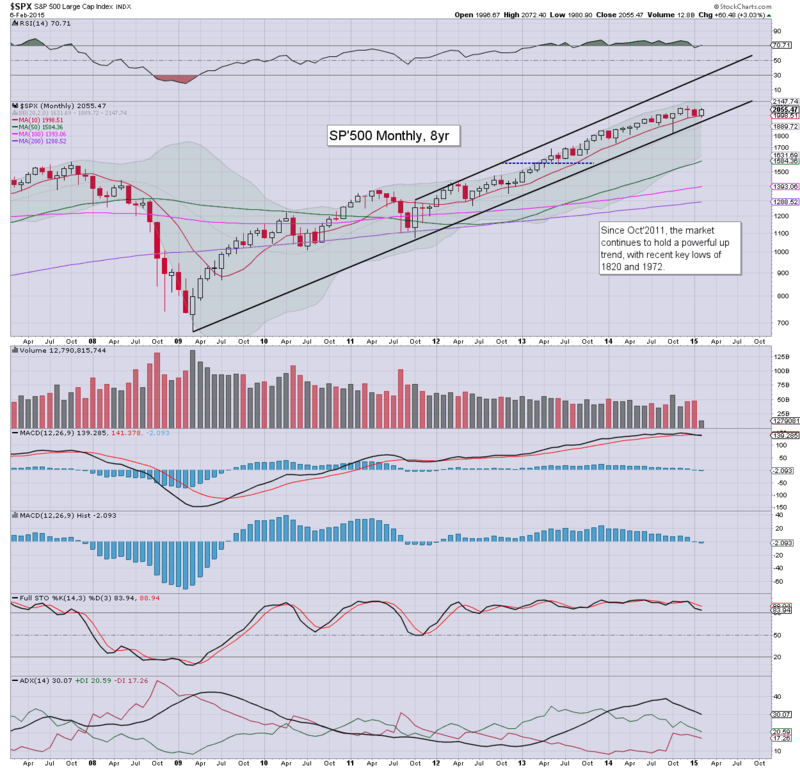 The giant 10k threshold remains a valid target for the equity bulls this spring. Underlying MACD cycle is set to turn negative in March... not least if Oil prices rise. So, we've seen a very strong week for US equities, after those early Monday lows. The power of the rebound is particularly bullish, and all indexes remain poised to break new historic highs. 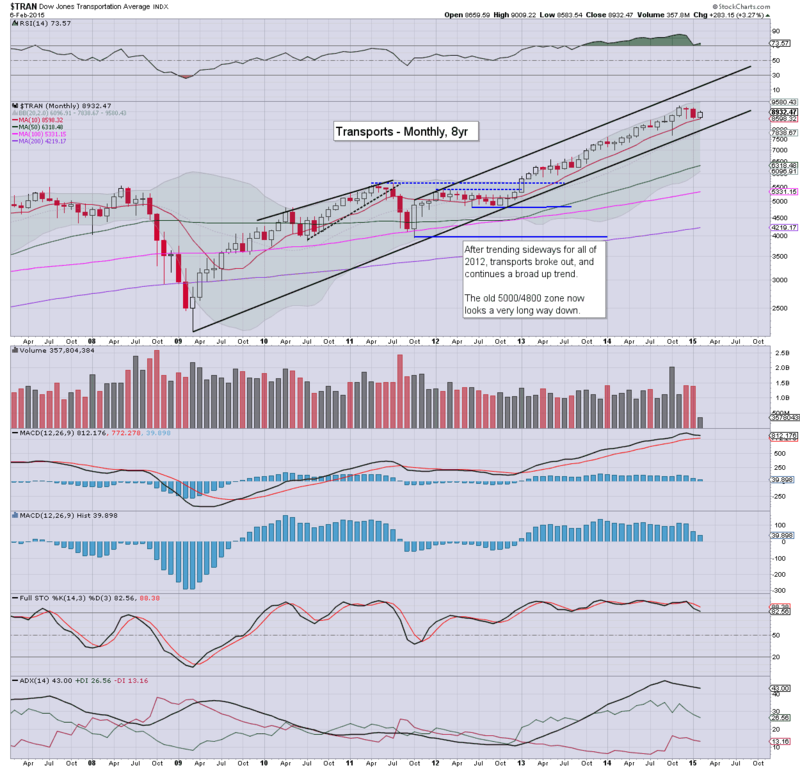 ...yet unlike 2014, 13.. or even 2012... the monthly cycles for most indexes are now negative MACD cycle... and price pressure is now slightly in favour of the equity bears. In my view, it will be VERY important for the market to break new historic highs within the near term. 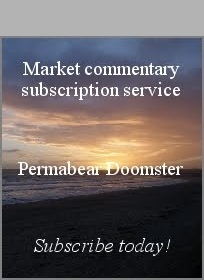 If instead the market remains stuck - under sp'2093, Dow 18103, and R2K 1221, then the market could have a serious problem. For now, I'll leave it at that. I could post all sorts of 'best doomer case' scenarios, but on balance, we're more likely to continue higher... than get stuck. A relatively quiet week is ahead.. although there will of course be the high possibility of sporadic comments/headlines revolving around Greece. Equity bears were again cruelly teased this week, with a Monday morning low of sp'1980, only to then see a hyper ramp to a Friday morning high of 2072. 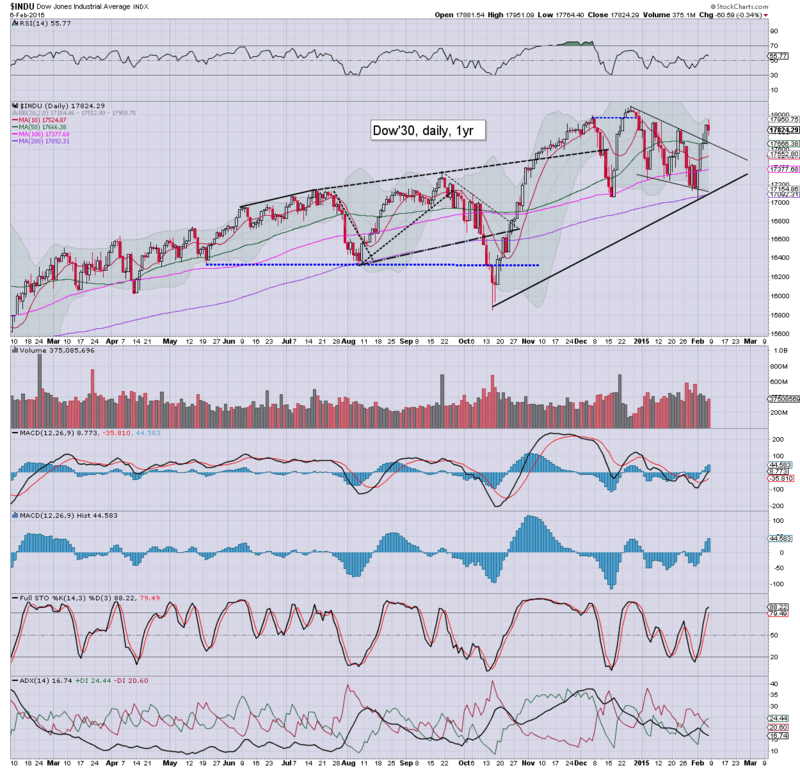 Despite continuing concerns about Greece, the sp'500 saw a net weekly gain of 60pts (3%), with the Dow +659pts (3.8%) @ 17824. Its been a long week, but a somewhat profitable and entertaining one. 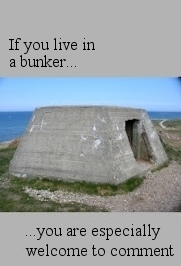 I'll leave it at that. 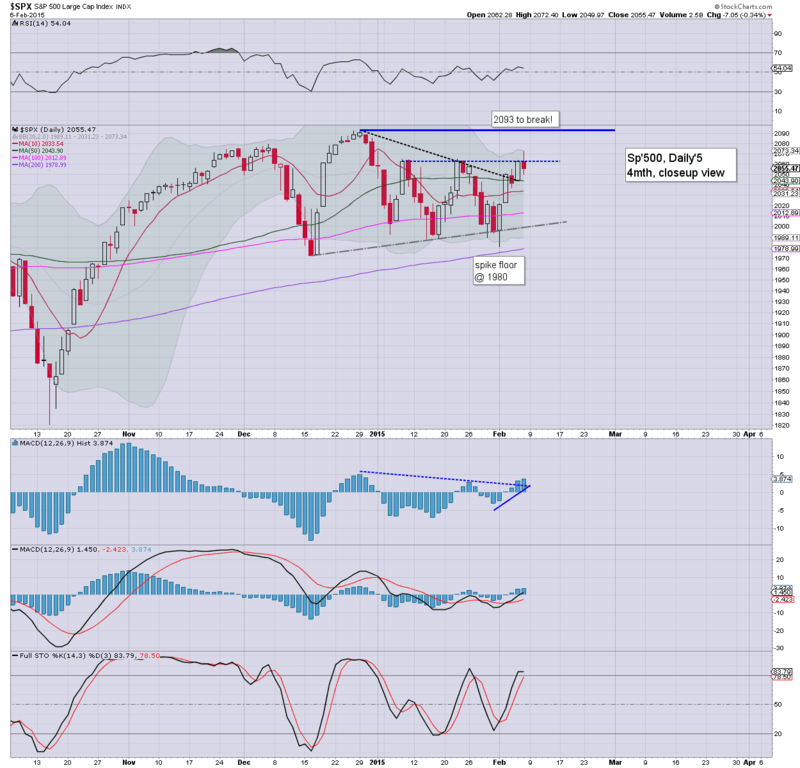 Equities broke key resistance of sp'2064 in early morning, with an intra high of sp'2072. 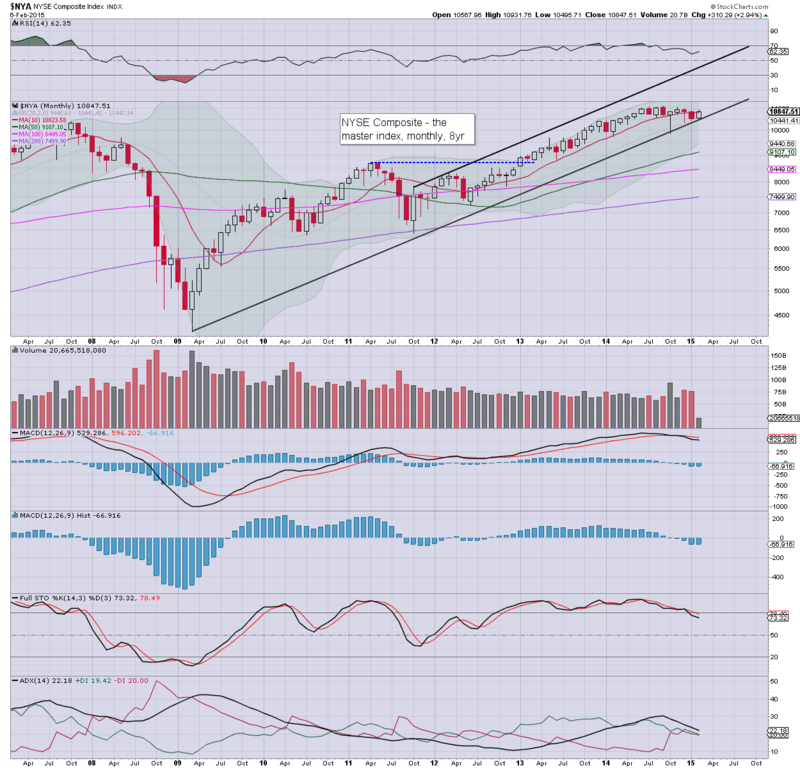 With renewed weakness into the close, sp'500, -7pts @ 2055. The two leaders - Trans/R2K, settled -0.4% and -0.3% respectively. Near term outlook is bullish, as suggested by the weekly cycle. Even though the market saw weakness into the close, the bulls did manage to break above key resistance of sp'2064... to within 1% of the Dec' high of 2093. The Dow looks particularly bullish. All that is left for the bulls to do now is break above the Dec' high of 18103... with viable further upside to the 18250/500 zone.